The Wonderful Wings stamp set is a super star for sure. What's not to love about a three-step stamp set that layers with great ease AND coordinates with a framelit set? I'll say it again--it's awesome. If you look close at the background panel you will notice another piece of handmade shaving cream paper. I posted about how to make the paper in the last Monday Montage Blog Hop. It's easy to make the paper, totally addicting, and each piece is so unique. 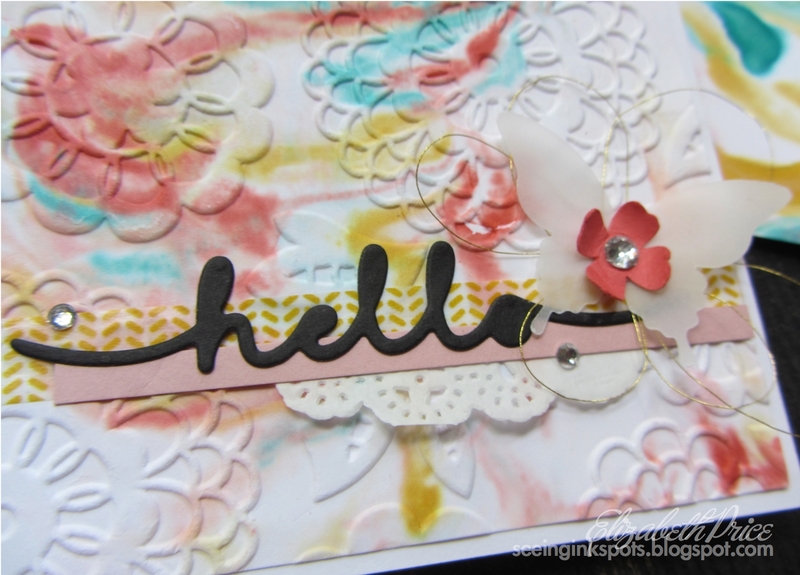 Welcome to a super sketch challenge from Hand Stamped Sentiments. At first I saw this sketch so literally--three pieces of DSP and a banner greeting. What greeting I thought. 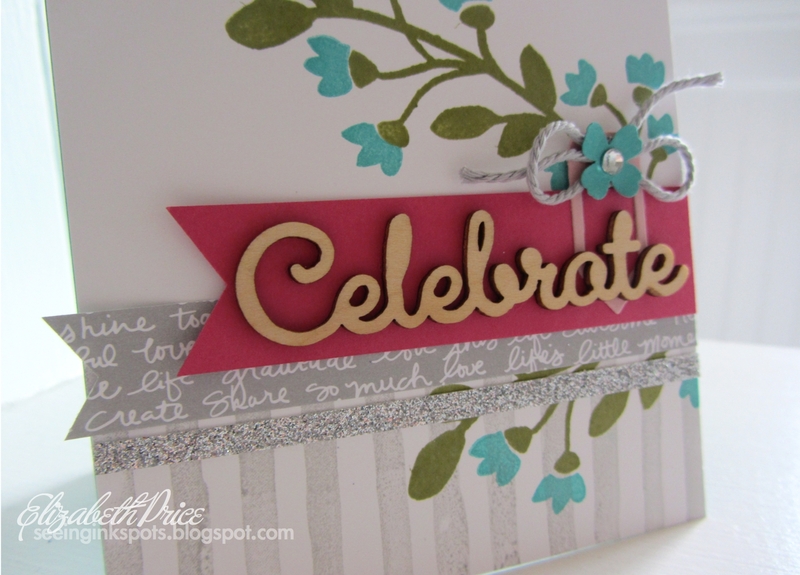 I was looking through my stack of stamps sets and decided to use an all-time favorite stamp set for my card called Choose Happiness. 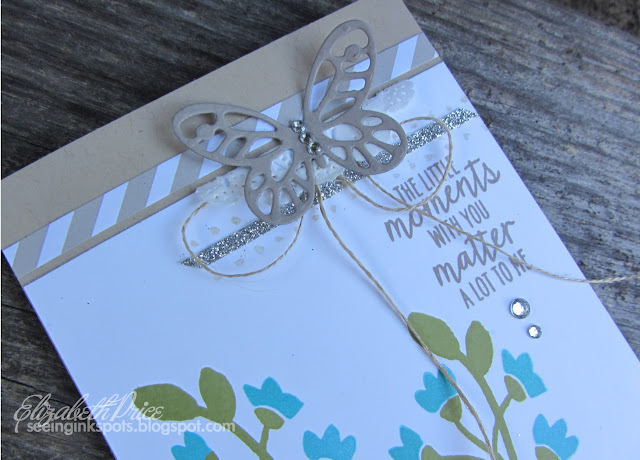 Then I got to the creating process and added a few extra elements to bring the card to life. Pieces like the layered scallop circle and the bird, the loops of linen thread, the tiny scrap of doily peaking out the banner, and the wooden "thanks" element. 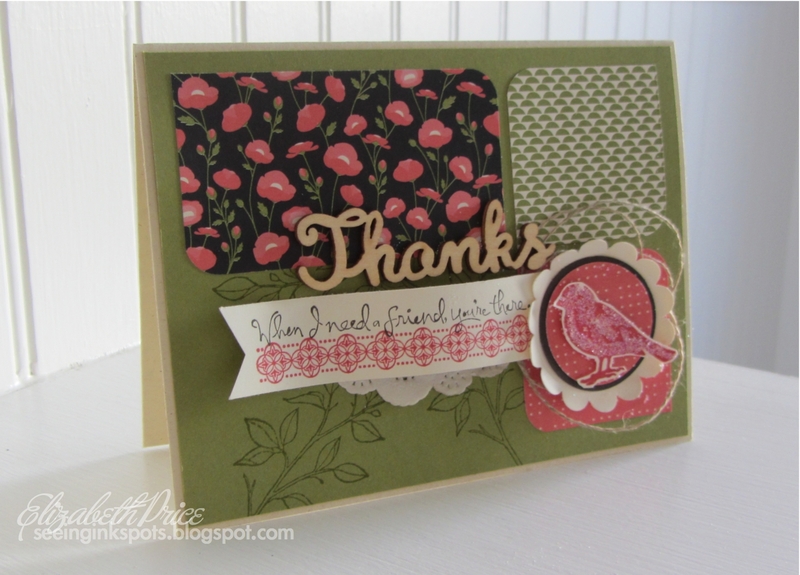 I am so grateful for this challenge as it pushed me to make a card I would never have designed. It's still a card with my flair, but it's a new look that is fresh and fun. Do you need a card makin' pick me up? Then go a accept the sketch challenge! Hi Stampin' Friends! It's so great to be hopping today. 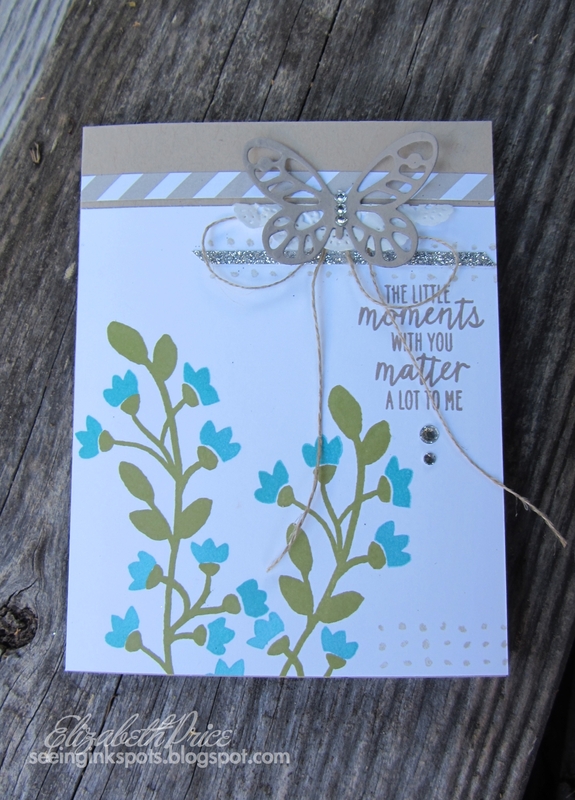 I have been away from home and any internet connetion for a full week--the week of the Stampin' Up! Convention. It was tough to be away and not be in attendance at convention as I have missed all the news announcements, the revel of the Holiday Catalog, and missed seeing my far away friends. It's the first time in 18 years that I have not gone, but it was for very good reasons. 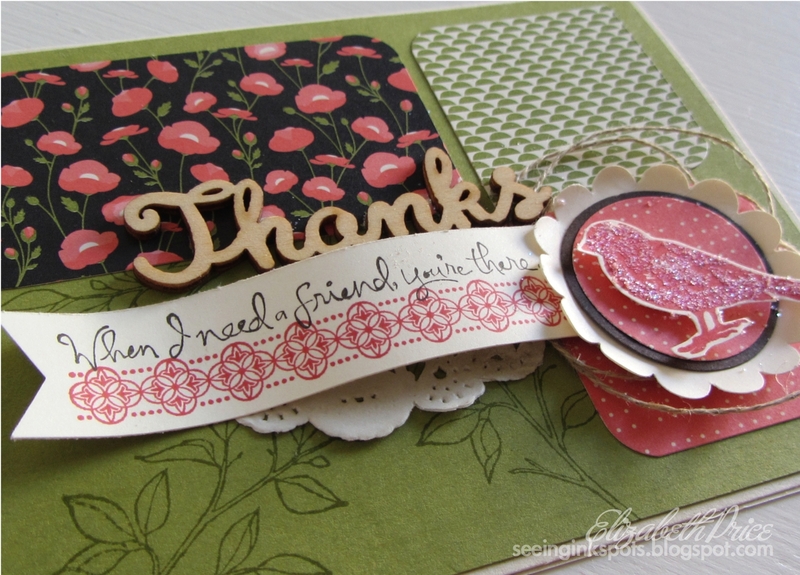 But now that I'm home it feels good to be stampin' and hopping again. A few months ago I had a special request to do shaving cream paper at our stamp class. While I aim to please I said "sure thing, we'll do it." I hadn't made any shaving cream papers in years, but once I got going it was a blast. To make them just follow the steps below. Squirt a layer of shaving cream, the foam kind, in a 9" x 13" pan. Add drops of ink refills. This involves some trial and error as too much ink takes over the look and gets muddy. Use a skewer or table knife to "cut" through the cream and swirl the ink. 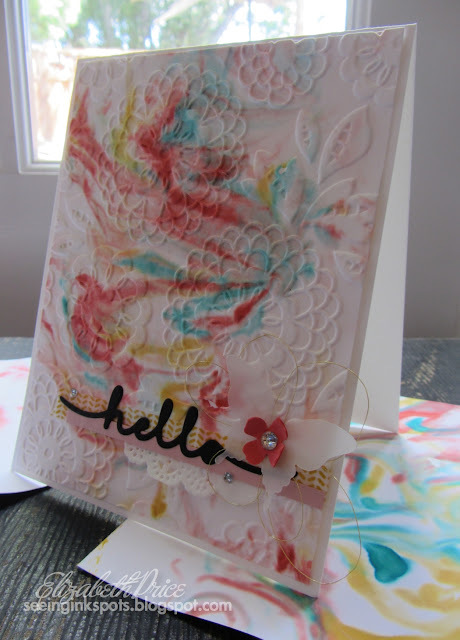 Lay a piece of paper, I like using 1/4 sheets of Whisper White or Very Vanilla cardstock, directly on top of the swirled shaving cream and gently press into the foam. Press enough to be sure that all areas touch the cream. 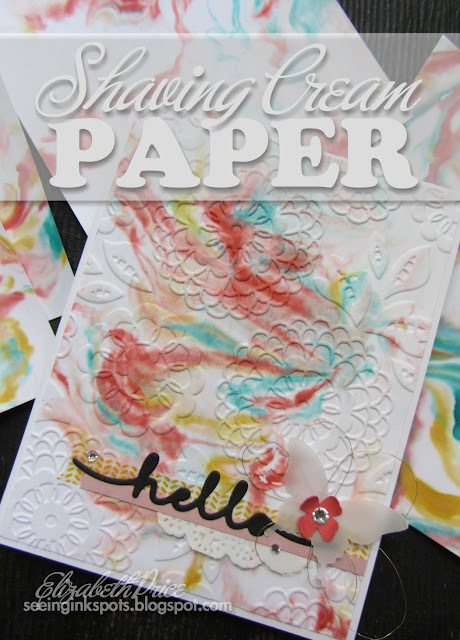 Note: you can use the same swirled cream to make multiple pieces of paper. Pull the paper out and lay on a flat surface then gently "shave" the paper by scraping it with a rubber spatula. A metal spatula will rip the edges of the paper. Allow to air dry or speed the drying process with a heat tool. Hello stamp friends! One set that I got with the release of the new catalog was the Bountiful Borders set. I love it as it is super easy to work with. For this card I had some fun with colors. I really like the pop of Melon Mambo with the Bermuda and Olive. 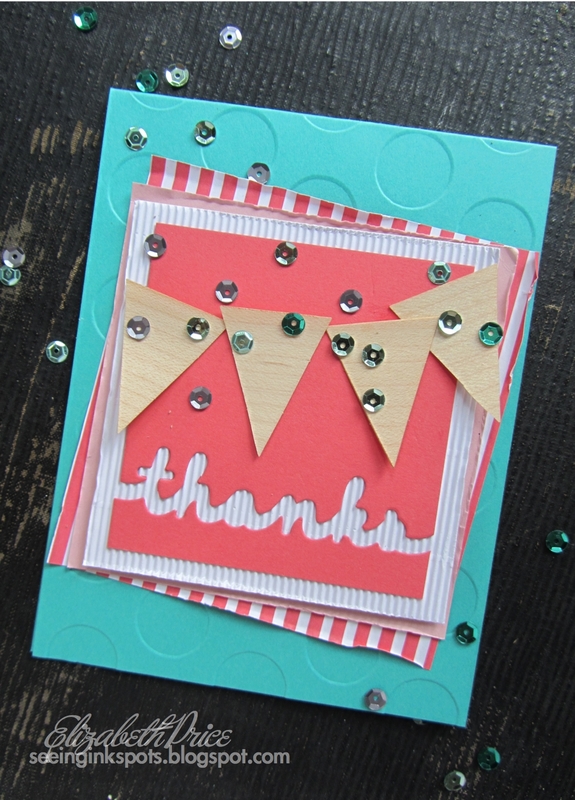 Oh, and the Natural Expressions wooden embellishments are so fun. They bring a lot of "pow" to cards. Get some--they're awesome. Also, if you look real close you'll see a Blushing Bride paper paper clip. I like how it frames the letter "t" in the greeting. One last bit of information...the bow is made with the new Smokey Slate Thick Twine. Welcome, welcome to another color challenge hosted by a fun group of stampers over at Hand Stamped Sentiments. 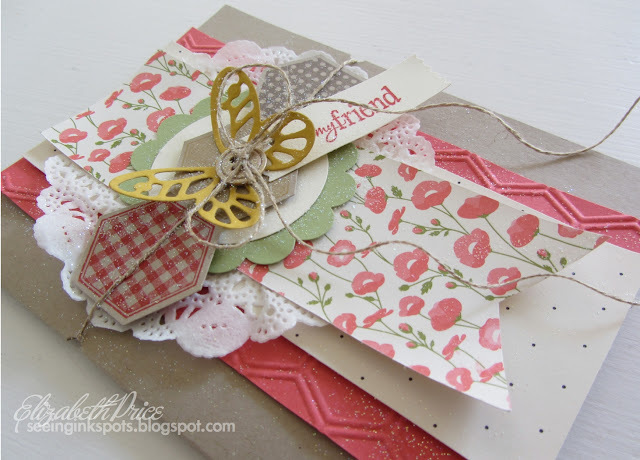 These colors totally conjure up a summer attitude and for this one I skipped out on any stampin'. 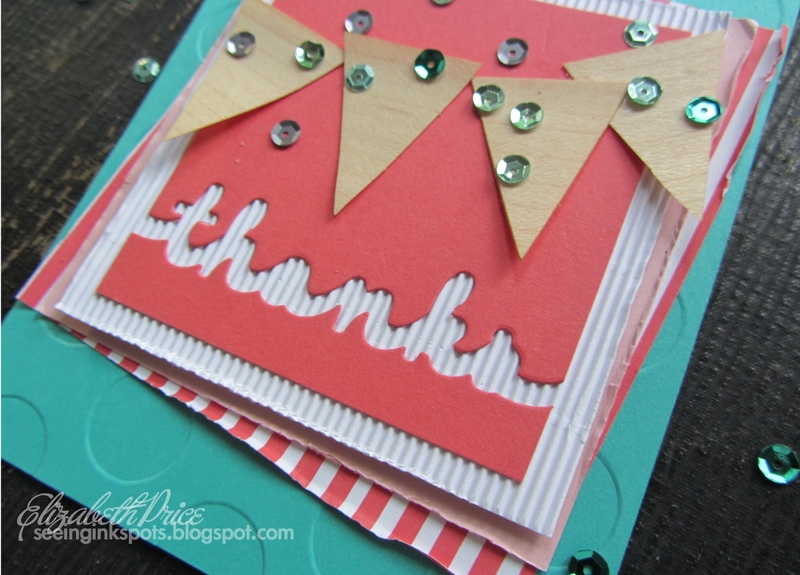 I just went for some offset layers to highlight my Greeting Thinlet. Isn't the Corrugated Paper fabulous? 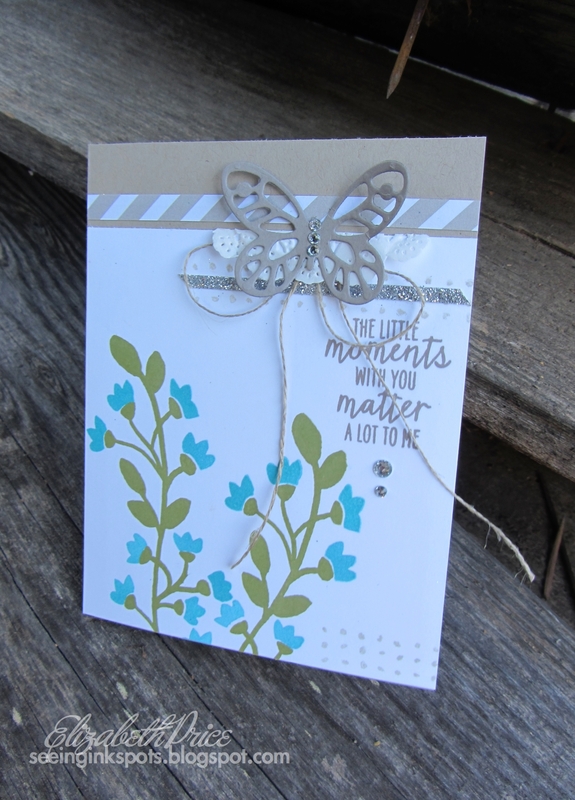 It's cardstock weight and comes in a pack of two sheets of Whisper White and two sheets of Kraft. The texture is "small fluting" and the sheets are 12" x 12". It's cool stuff and totally takes the card over the finish line. If you count them all it's nine, yes nine, layers of yumminess. 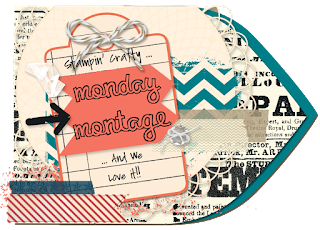 I decided to post my crazy-happy layered card for today's episode of Monday Montage because this one makes me smile. I lately have liked things to be clean and simple. 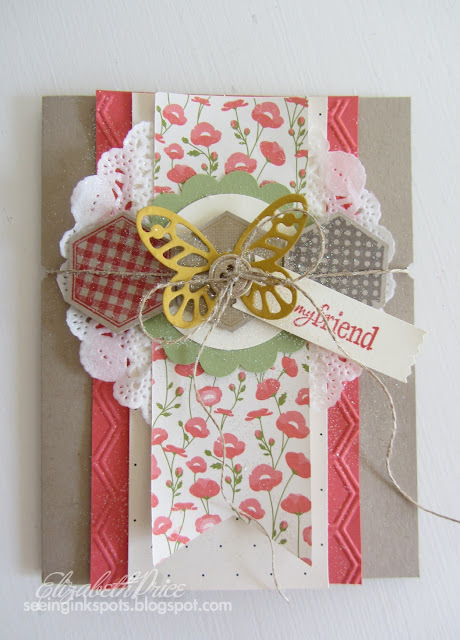 I have stayed away from frilly layers, but not for this card. 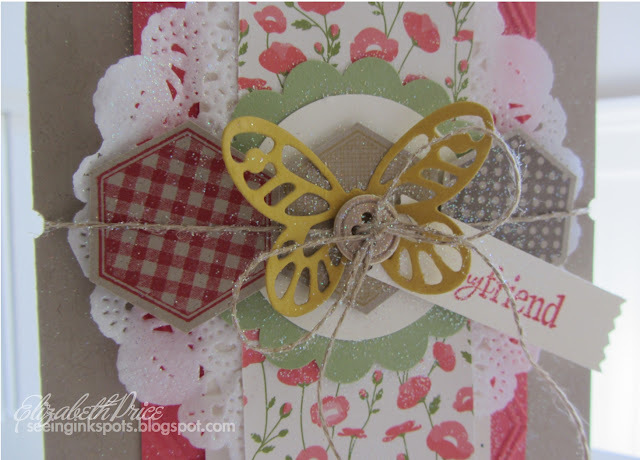 Here is the rundown of the layers: card base is Crumb Cake, honeycomb textured layer is Watermelon Wonder, next two layers are from the Pretty Petals DSP Stack with a layer of doily in between, then a Pear Pizzazz scallop circle, a Very Vanilla 1 3/4" circle, then three Six Sided Sampler hexagons stamped on Crumb Cake, a Hello Honey Bold Butterfly, and last a Gold Button tied with some Linen Thread. 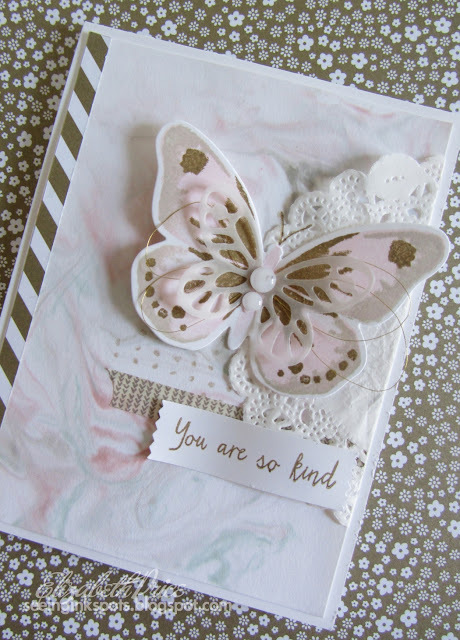 Have you ever made a card and finished and just loved how it all came together? This was one of those for me. Yesterday I was prepping for my Technique Time! stamp class for later this week and had a big mess on my table. In the mess were scraps and rejects that didn't make it into the class. Instead of cleaning up I saw the pieces and made another card, in fact this was a second. 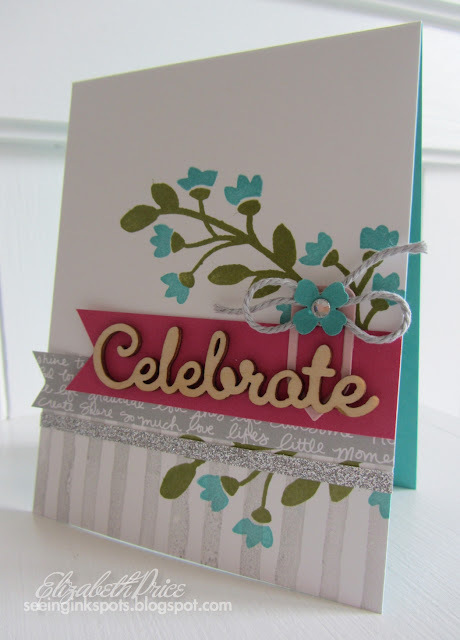 I started with a piece of Whisper White cardstock on which I stamped the Bountiful Border Two Step stamps. 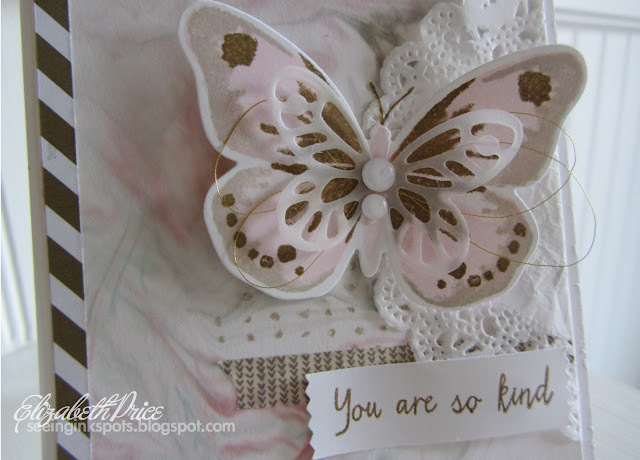 My colors, which are inspired by my friend Dena Rekow who puts the best combos together, are Old Olive, Bermuda Bay, Crumb Cake, and Tip Top Taupe. Of all the details on the card my favorite scrap is the tiny piece of doily tucked under the Bold Butterfly cut out.